The 4-star s Hotel Albion in the valley of Val Gardena (in German: Gröden) impresses with its stylish combination of clear-cut modernism, linear shapes and cozy interior on the panoramic terrace situated at the foot of the Alpe di Siusi (in German: Seiser Alm). The new elements in biological construction harmoniously join the existing structure. Nature is seen as a competent partner, which is reflected in architecture, spa programs and in the comfort of local woods and stones. 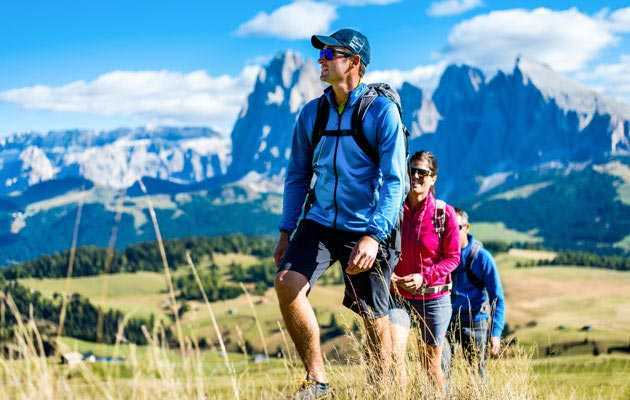 Val Gardena and Alpe di Siusi: a fascinating hiking area in the picturesque mountain setting of the UNESCO World Natural Heritage of the Dolomites and the ideal place for unforgettable hiking holidays in summer and action-packed ski holidays in winter. The Hotel Albion is the best starting point for eventful holidays in South Tyrol, both for sporting activities like hiking, mountain biking, skiing and cross-country skiing and for strolling through and shopping in the picturesque villages of Ortisei and Castelrotto. Dreamy living in generous atmosphere: Cozy warmth and comfort, the scent of wood and in addition the marvelous view on the elegant Dolomites which keeps fascinating the eye! Romantic rooms and luxurious suites invite you to lean back and relax. Natural materials, alpine design and the utmost comfort guarantee a unique living experience. 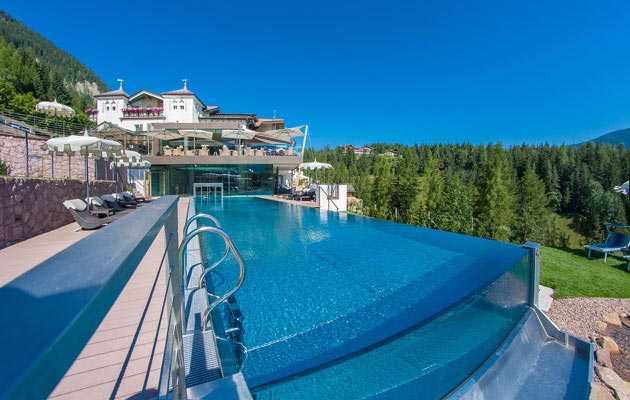 The Mountain Spa Hotel Albion is THE place to unwind and relaxin your spa holidays. Immerse into the AVALON Wellness & Spa-World and revive in the wellness area covering more than 2.000 square meters. Next to various saunas and baths, we offer a Turkish bath, a tepidarium, relaxation showers and various pools with the most wonderful view on Ortisei in Val Gardena. Unique in the Dolomites, the new outside Alpine Skypool, the alpine Nature Kneipp Therapeutic Course, the alpine bathing lake and the shower grotto with natural springwater. Revitalizing beauty rituals, balancing baths, relaxing massages: let yourself be pampered in our beauty area ALAUNA with private SPA and enjoy the beneficial treatments. The beauty area is open daily. We are happy to advise you during a welcome drink. Start your day actively: our tour guide Simon daily informs you about the numerous hiking tours starting directly from our hotel and takes you on adventurous outings for free. All hiking tours organized and offered by our hotel are free of charge. Our hiking shuttle takes you to the respective starting points as well as to the meeting points of the program “Val Gardena Active”. In your activity holidays you can also spend an active day on our floodlit tennis court, in the Cardio Fitness Studio or playing boccia. The admission to all these offers is free. 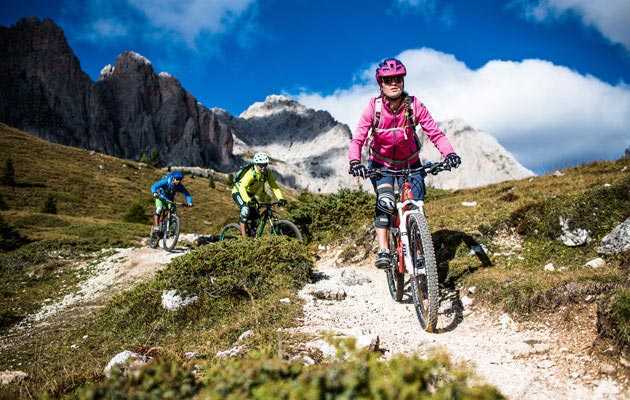 Val Gardena and Alpe di Siusi offer you numerous additional sporting occasions: golfing on the 18-hole golf course Castelrotto in Siusi, riding, jogging across the Alpe di Siusi (a paradise for joggers! ), paragliding, rafting, canyoning and climbing, skating, fishing and canoeing. Our alpine cuisine is a culinary declaration of love which uses herbs from our own garden and prepares the various dishes with utmost delicacy. South Tyrolean specialties and typical Italian dishes form the perfect symbiosis of light and traditional cuisine. Our chef puts particular emphasis on the high quality and exclusive variety of fresh, local ingredients. Places meant for moments of comfort: no matter which room you choose – be it the comfortable lounge all kept in Tyrolean style, the hotel bar or the panoramic terrace overlooking Ortisei – you will surely feel at home with us. Rollicking about and laughing in the adventure park „King Laurin“ (400 square meters) with a 8-meter-high tower slide, on the outdoor playground or in the hotel park. The Family Hotel Albion offers tons of fun for your holidays with kids!